Is P.E.A. 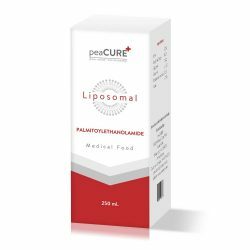 Cure available in the U.S.? Yes. In 2015 Care Pharmaceuticals introduced the supplement P.E.A. Cure. It is produced in 400 mg doses and is available in packages of 60 and 90 vegetarian capsules each. The benefit of P.E.A. Cure is that it is pure and contains no chemical additives like sorbitol or magnesium stearate (which is present in other PEA supplements, including Normast). The response of customers to this supplement is very good. Where in Canada is P.E.A. Cure available? P.E.A. Cure is available all over the world through our website shop. Will P.E.A. Cure be reimbursed by my insurance? Unfortunately, health plans in the United States don’t reimburse for patients for supplements as they do for prescription medicines. Fortunately, P.E.A. 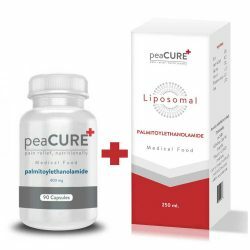 Cure has made the supplement less expensive and of a higher quality than supplements such as Normast. For what types of pain can I use P.E.A. Cure? Because PEA is a compound produced by the body, it can be used for a lot of different types of pain. Various studies have shown it to be effective for neuropathic pain, jaw pain, dystrophy pains, wrist and hand pain, pain due to shingles, and back and leg pains, among others. Our private practitioners has successfully used PEA to treat patients for pain due to hernia, diabetes, post-stroke, post-paraplegia, multiple sclerosis, and for different types of polyneuropathy including small fiber neuropathy. Does P.E.A. Cure help hernia pain? The results of at least 28 studies involving more than 5,900 patients show that PEA is effective against a multitude of conditions related to pain and/or inflammation. Can I take P.E.A. Cure for flu? Yes. An extensive article published in the International Journal of Inflammation in 2013 discussed six clinical trials involving 3,627 patients, all of which showed PEA to be an effective treatment and preventative for flu. In case of acute flu or colds, take two capsules twice daily. For prevention during the flu season, take one capsule twice daily. Is P.E.A. Cure effective for muscle cramps? Yes, patients with nightly muscle cramps have been treated effectively with P.E.A. Cure. You can find chapter on muscle cramps and P.E.A. Cure under this link. Are there instances when P.E.A. Cure doesn’t work at all? We’ve answered this question extensively under this link. Can P.E.A. Cure be taken in combination with other painkillers or medicine? There are several studies in which PEA was successfully combined with common prescription drugs (e.g. Lyrica or Oxycodon) to treat neuropathic pain. In fact, the studies reported that, in combination with PEA, the side effects of Lyrica and Oxycodon decreased. PEA can be used safely with painkillers or other medicine and will often increase their effectiveness. More than ten thousands customers throughout Europe (primarily in Italy, Spain, Germany, Belgium, and the Netherlands) have used PEA, with no report of serious side effects. Research from 2013 shows that even high daily doses (up to 100mg per kg [2.2 lbs] of body weight) cause no side effects. Children can safely take up to 50mg of PEA per kg of body weight. P.E.A. Cure can be safely combined with other supplements and medicines. Because PEA is a substance that occurs naturally in the body, no serious side effects have been reported with its use as a supplement, even at the highest doses. How much PEA should I take? P.E.A. Cure comes in 400mg capsules. People older than 65 can use the recommended dose of P.E.A. Cure (1200 mg per day). Throughout Europe many hundreds of people over age 65 have used this dose without any problems. The oldest patient treated with PEA in the United States was 87 years of age and didn’t experience any side effects. Take at least 1,200 mg per day for the first month—two capsules in the morning and one in the evening. Always take P.E.A. Cure during or after a meal. How soon can I expect to notice results with P.E.A. Cure? Based on our experience, you should experience a decrease in pain between day one and 28 after you start taking P.E.A. Cure. However, more challenging types of pain will require longer use before you feel results. Some people don’t notice the effects until they stop taking P.E.A. Cure and realize that their pain had decreased over the weeks. To get the optimal results from P.E.A. Cure, we recommend that you start with a two-month supply (two bottles of 90 capsules each). For the first 10 days, rather than swallowing the capsules, remove the powder from them and place it under your tongue. After the tenth day, you may swallow the capsules. Why does it take so long to experience pain relief? Because it works with the natural mechanisms of the body, it sometimes takes longer to notice effects with P.E.A. Cure than it would with chemical painkillers, which shut down the nervous system immediately. P.E.A. Cure resets the body through a series of biological mechanisms, beginning when the PEA molecule enters the body and binds with a specific part of the cell, called the nucleus receptor. P.E.A. Cure works naturally with your body to calm and stabilize cells that produce pain- and inflammation-causing substances. It may take a few weeks to noticeably decrease the pain and inflammation in the body. I feel happier after using PeaCure. Could that how it works? P.E.A. Cure has been noted by some to have certain mood-lifting properties. More about that under this link. Where can I find the science behind P.E.A. Cure? You can access articles under this link and save or print them. Because PEA is a natural supplement, rather than a prescription drug, many doctors will not yet have heard of it. A special information sheet is available under this link, so that your doctor can find out about the scientific research behind PEA. Are there any other supplements that contain PEA? There are other supplements that contain PEA, including Pelvilen and Normast. However, the percentage of PEA in those products is quite low. Additionally, Normast, Pelvilen and other Italian-made PEA products are not available in the United States, because they are only registered in Italy and Spain. Exercise care when buying products containing PEA, as not all such products are certified for purity and may contain additives or substances, the safety of which is not entirely clear. Are there differences between P.E.A. Cure and Normast? Though both contain PEA, Normast contains magnesium stearate, a chemical filler/additive that is known to decrease the effectiveness of PEA. Normast powder also contains the sweetener sorbitol, which may cause diarrhea, cramps and bloating. P.E.A. Cure contains only PEA, entirely pure and without pharmaceutical fillers, additives or sweeteners. The capsule also doesn’t contain gelatin, like many capsules do. Patients that have used Normast and tried P.E.A. Cure said that the powder from the capsule is more pleasant to take under the tongue. Because it contains no sweetener, it does not produce saliva but melts easily in the mouth and is immediately taken into the bloodstream through the mucus membranes. People who have done well on Normast also do well—or even better—with P.E.A. Cure. 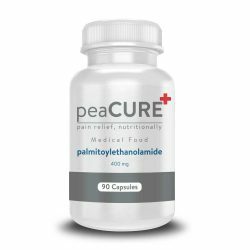 Where can I find cheap palmitoylethanolamide (PEA)? We often get asked about cheap PEA. Recently, an increased number of cheap PEA supplements have become available. However, as with most anything, you get what you pay for. If you purchase “cheap” PEA, don’t expect that it will be of high quality. The key quality factor is the production method used. We produce P.E.A. Cure using a strict and highly standardized process. There are PEA capsules on the market that have not been validated for safety or effectiveness. Furthermore, there are PEA capsules that contain titanium oxide as a coloring. According to the International Agency for Research on Cancer (IARC) titanium oxide is a substance that causes cancer. Therefore, be sure to look for pure PEA, without colorings or other chemical additives.